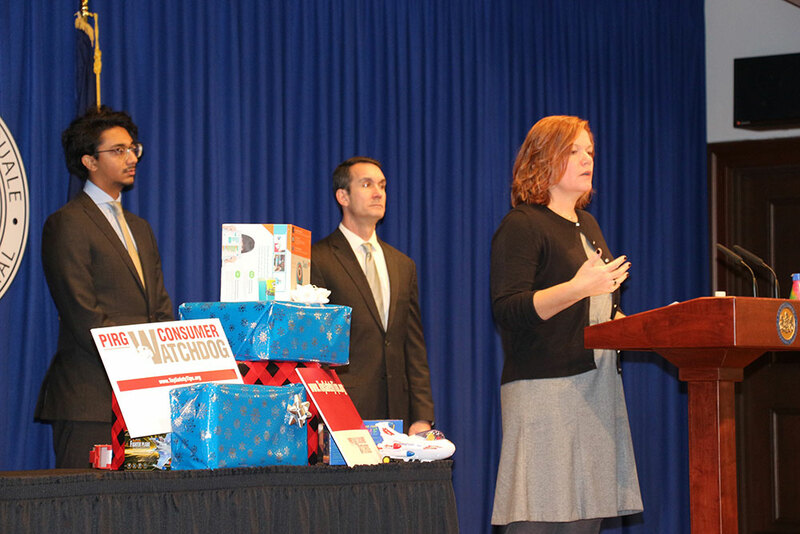 Pediatric Trauma and Injury Prevention manager Amy Bollinger, right, discusses unsafe toys at a press conference with, from left, Reuben Mathew of PennPIRG and Pennsylvania Auditor General Eugene DePasquale. Penn State Children’s Hospital Pediatric Trauma and Injury Prevention Manager Amy Bollinger joined Pennsylvania Auditor General Eugene DePasquale and consumer watchdog group PennPIRG at the state capitol on Nov. 20 to discuss dangerous toys during the holiday shopping season. PennPIRG released a report about toys that contain toxic chemicals and choking hazards, and Bollinger educated consumers on what to know and what to look for before buying toys for children. She warned caregivers to be aware of toys with small parts, toys or electronics with button batteries, mobile toys like bikes and scooters and older toys that may no longer adhere to current safety standards. See the 33rd annual “Trouble in Toyland” safety report on the U.S. PIRG website. Also, Bollinger will share more tips in “Ask Us Anything About…Toy Safety,” a live interview on the Hershey Medical Center Facebook page (www.facebook.com/pennsthershey) at noon on Thursday, Nov. 29.